I wanted to share the recipe for my new favorite snack to make - Melba toast! I've always liked the store-bought Melba toast, but it seems a bit expensive for the amount of toast you get and it's not exactly low calorie. I didn't realize how easy it was to make until one day I really wanted some but didn't want to bother with going to the store. I did happen to have a loaf of my low-calorie sliced white bread, and I wondered if I could use it to make Melba toast. I went on the internet and found numerous recipes, very few of which agreed with one another. So I experimented quite a bit and came up with my own recipe! - First, preheat your oven to 350 degrees F.
- Next, toast your bread. It should be as well-browned as you can get it without burning it - I usually use a toaster oven. Keep in mind that you will get four pieces of Melba toast for every slice of bread you use. 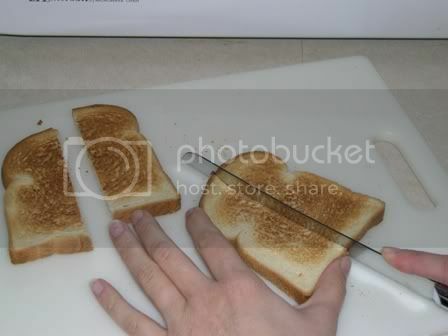 - Now, cut each slice of bread in half lengthwise (see photo below). 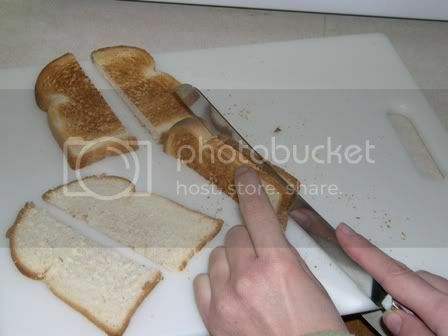 - Standing the half of toast on end, split it through the middle (see photo below). 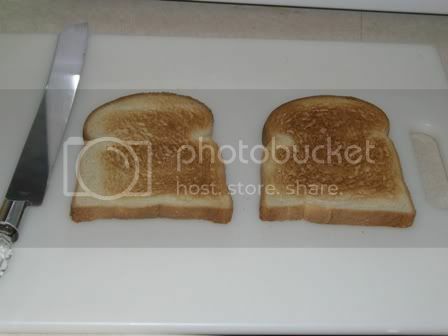 You should now have two quarters of toast, each untoasted on one side. 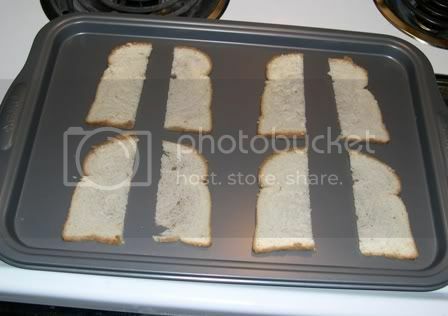 - Arrange all the toast quarters on a baking sheet with the untoasted sides facing up (see photo below). Place baking sheet in oven on center rack. - Now all you have to do is check the toast often and remove each piece once it is evenly browned (as in photo at the top of the post). I usually check on it after four minutes and then every two minutes thereafter. 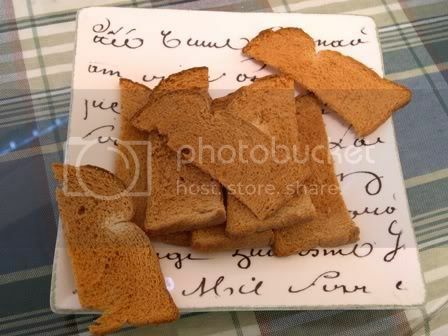 The pieces of Melba toast will not brown at the same time - thinner slices will brown first. Make sure that you check them often and remove each piece when it is ready to avoid burning anything. For me, the thinner pieces usually take 4-6 minutes and the thicker pieces take 10-12 minutes. I love eating Melba toast with fancy cheeses, but it is also good as a side dish with soups and pasta. You can make it out of any type of bread you like, including french bread. I personally think that, for Melba toast, white bread tastes better that wheat. I like to use light Wonder bread, which only has 40 calories per slice, so only 80 calories for 8 pieces of Melba toast. Yum! Hi Cathy! I stumbled upon your blog while in search of melba toast recipes to include in a post I am doing for National Melba Toast Day, March 23rd. I love the way you have given such precise directions for do it your selfers. I hope you don't mind if I "grab" this link to include in tomorrow's post. Thank you so much for sharing. Glad you like it! Who knew that there was a National Melba Toast day? I've subscribed to your blog and look forward to reading about it. Cool, thanks for explaining step by step and including pictures because im more of a visual learner i cant follow directions to well. So thanks! You're welcome, Maria! Glad my directions helped you.